Amy Sharrocks is a film maker, sculptor and live artist based in London. She is a recipient of a current Artsadmin Bursary. 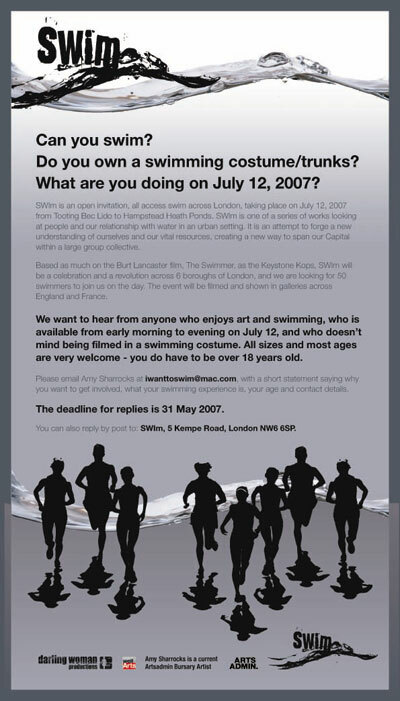 SWIm was an open invitation, all access swim across London, taking place on July 12, 2007 from Tooting Bec Lido to Hampstead Heath Ponds. SWIm was one of a series of works looking at people and our relationship with water in an urban setting. It is an attempt to forge a new understanding of ourselves and our vital resources, creating a new way to span our Capital within a large group collective. A ‘comment’, or in fact several little-ish ones – as well as a request! …as I would have loved to have been in the SWIm with you at the Thames Festival last weekend, but the tides of people were against me! I then missed your ‘little pool of London’ a second day running when I necessarily had to ‘go with the flow’ and head upriver to join other artist friends who were having their watery way with the world around Gabriel’s Wharf and Oxo Tower. But with my feet now back on the ground, and both metaphorcially and physically on ‘dry land’ – under my Thameside home/office table! – I thought that I should at least try to catch up with via email/your blog, not least because, as a compulsive pedestrian and riverbank resident, I wanted to say – as I wanted to do in person, a week ago! – that I so agree that it’s the water and walkways (and how we choose to discover and use them) that define and enrich life in this city for each of us. And so, despite not having ‘dipped my toe in the water’ at the Thames Festival, I would love to be part of your ‘aquatics team’ during that Olympic summer, and in this way the artistic ‘ripple effect’ from the main MacSport event a little further east and south! Tower Bridge here we come? ?